Ministry of Petroleum & Natural Gas has launched Sustainable Alternative Towards Affordable Transportation (SATAT) aimed at providing sustainable alternative towards affordable transportation. The initiative was launched with PSU Oil Marketing Companies (OMCs i.e. IOC, BPCL and HPCL). 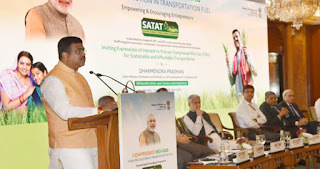 The SATAT initiative has the potential to boost availability of more affordable transport fuels, better use of agricultural residue, cattle dung and municipal solid waste, as well as provide additional revenue source to farmers. It will also benefit vehicle-users as well as farmers and entrepreneurs. Under it, Expression of Interest (EoI) have been invited from potential entrepreneurs to set up Compressed Bio-Gas (CBG) production plants and make biogas available in the market for use in automotive fuels. It will boost the availability of more affordable transport fuels and enable better use of agricultural residue, cattle dung and municipal solid waste. It will pave the way for a efficient municipal solid waste management and help in tackling problem of polluted urban air due to farm stubble-burning and carbon emissions. It will boost the entrepreneurship, rural economy and employment and provide additional source of revenue to farmers. It will also help achieve nation's climate change goals and bring down dependency on natural gas and crude oil imports and act as a buffer against crude oil and gas price fluctuations. It will also help to integrated CBS networks with city gas distribution (CGD) networks to boost supplies to domestic and retail users in existing and upcoming markets. Besides retailing from OMC fuel stations, CBS can at later date be injected into CGD pipelines too for efficient distribution and optimised access of cleaner and more affordable fuel. Q. Ministry of Petroleum & Natural Gas has launched which initiative aimed at providing affordable transportation?